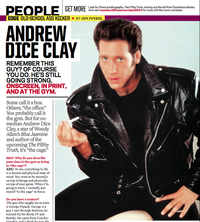 Check out the interview with Andrew Dice Clay in the new edition of Muscle & Fitness Magazine. Interview by Jon Finkel. Remember this guy? Andrew Dice Clay! Of course you do. He’s still going strong. M&F: Why do you describe your time in the gym as being in “the cage”? ADC: To me, everything in life is a mental and physical state of mind. You want to be mentally on top of things and physically on top of your game. When I’m going to train, I mentally put myself “in the cage” to focus. The guy who taught me to train is George Pipasik. George is a guy I met through Stallone; he trained Sly for Rocky IV and Rambo. He came from Czechoslovakia, and I think he was Mr. Czechoslovakia four years in a row. He had amazing strength and a great physique. He taught me how to work my body. Do you listen to music when you train? I like to listen to things that’ll get me fired up a little bit. A lot of times when I go to Gold’s, I’ll ask the front desk to blast the music. But sometimes I’ll get my own workout playlist going. I have everything on there from Led Zeppelin and Guns N’ Roses to my sons’ band, L.A Rocks. Guys like Hugh Jackman are in unreal shape. That’s what you have to be today to be a leading man. The only one before Sly, who was unbelievable, was Charles Bronson. How important is it to be in excellent shape to perform? To give a great show, you have to be in good shape. I like to be physical onstage. The crowd’s energy is ridiculous. Look for Dice’s autobiography, The Filthy Truth, coming out this fall from Touchstone Books.